2 links pointing to Cdfarmersmart.co.uk were found. The most used keywords in text links are Cumberland Dumfriesshire Farmers mart plc and Cumberland. The most important links to the website are from Tumpline.co.uk and Tumpline.com. The homepage of Cdfarmersmart.co.uk and the subsite are most referenced by other websites. The table shows the most important links to Cdfarmersmart.co.uk. The table is sorted in descending order by importance. The table shows websites of Cdfarmersmart.co.uk, which are often linked by other websites and therefore they are classified as important content. two profiles were found for Cdfarmersmart.co.uk in social networks. Among other social networks the website is represented in Facebook and YouTube. 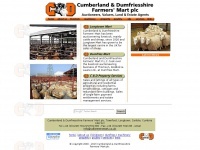 The web server used by Cdfarmersmart.co.uk is located in Gloucester, Great Britain and is run by Fast Hosts LTD. On this web server 58 other websites are hosted. The language of those websites is mostly english. A Nginx server hosts the websites of Cdfarmersmart.co.uk. The website uses the latest markup standard HTML 5. Indexing the data of the website and following hyperlinks on it is explicitly allowed by robot information.